NAIROBI, Kenya, August 19, 2014 (ENS) – Some 100,000 elephants were illegally killed for their ivory between 2010 and 2012, finds the first verifiable estimate of the impacts of the ongoing ivory crisis on Africa’s elephant populations. Published Monday in the journal “Proceedings of the National Academy of Sciences of the United States,” the study is the first detailed assessment of African elephant illegal killing rates at population, regional, and continental scales. Using data and experience from an Africa-wide intensive monitoring program, the paper’s lead author George Wittemyer of Colorado State University calculates that, on average, 33,630 elephants were killed in each of the three years studied. The number of elephants remaining in Africa is “uncertain,” says Wittemyer, but he estimates that these losses are driving declines in wild African elephants on the order of two to three percent a year. Preliminary data indicates that unsustainable poaching levels continued in 2013. The most thoroughly studied site was Samburu in northern Kenya where every elephant birth and death over the past 16 years has been recorded in a long-term monitoring project that Wittemyer co-founded with Save the Elephants, in association with the Kenya Wildlife Service. The Save the Elephants field team collects data on a daily basis. 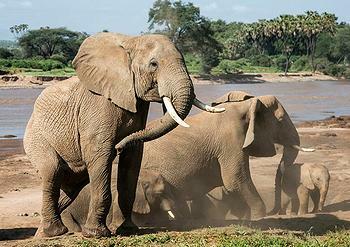 The elephants using the Samburu and Buffalo Springs reserves, an area of 330 km2 near the Ewaso Ng’iro river, are habituated to the presence of vehicles, enabling easy observation of behavior. 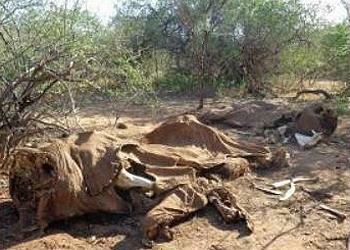 The researchers determined illegal killing in Samburu began to surge in 2009. This surge was directly correlated to a more than quadrupling of local black-market ivory prices (the poacher’s price) and tripling in the volume and number of illegal ivory seizures through Kenyan ports of transit. The data also show that the destination of the illegally trafficked ivory increasingly shifted to China. ”This study helps make sense of the challenge faced by thousands of rangers working on the frontlines to protect elephants and other species across Africa” said co-author Julian Blanc of the Convention on the International Trade in Endangered Species, CITES, secretariat. “It also highlights the importance of the accurate collection of data as part of their day-to-day patrol work, which is essential to understand and communicate the true proportions of the threat that elephants face,” said Blanc. The team used the intensive study of the Samburu elephants to translate less detailed information from 45 elephant populations across Africa to estimate natural mortality and illegal killing rates to model population trends for the species. The CITES-mandated global program known as Monitoring of Illegal Killing of Elephants, or MIKE, establishes cause of death for each elephant carcass found in these sites and this has provided the best measure of poaching pressure. Over the last decade, the proportion of illegally killed elephants has climbed from 25 percent to 60 to 70 percent. These figures cause conservationists alarm, as the study shows over 54 percent is a level of poaching that elephant birth rates are unable to overcome and will lead to population decline. “These tragic numbers underscore the urgency of banning the ivory trade. 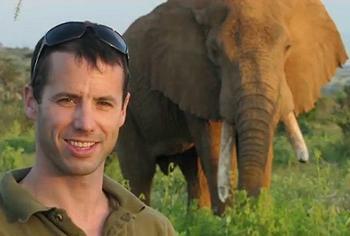 Recent Wildlife Conservation Society research has shown that any legal trade of ivory will only embolden organized crime syndicates to continue poaching and smuggling,” said John Calvelli, Wildlife Conservation Society executive vice president of public affairs and director of the 96 Elephants Campaign, named for the number of elephants killed each day. For the newly published study, two types of model were used to establish figures rather than proportions. One focused on the elephant populations with the best information and used them as an indicator for the conditions in their region of Africa. The other used proxy variables such as Chinese consumption rates, a corruption index, and poverty rates to estimate illegal killing in 300 sites. Both came to similar conclusions.